However, my boyfriend is a parent to two teen-agers on spring break, and many of my friends are teachers who’ve been sleeping in and/or travelling to warmer climes this week. So, I have absorbed the Spring Break mindset from them, by some sort of weird osmosis. I stayed up too late almost every night this week, reading or watching DVDs till 11:00 and later – despite the fact that my alarm was going to go off at 5:30 am the next day. And by Friday, I was paying for it. I was in bed early with a throbbing headache last night. The weather here is not particularly “spring break”-like, however. It’s been mostly cool and cloudy. And for me, it’s been a little lonely, too, with so many friends away. So I’ll be glad to get back to ‘ordinary time’ next week. On another note – I’ve mentioned my love of fashion magazines here before. But sometimes, even fasion magazines are just downright annoying. On the cover of Vogue this month is this ‘teaser’ for an article inside: “Nobody’s Perfect: Seven Women Obsess about their Body Flaws. All I could think was – What a Godawful depressing article THAT must be! Why would they put that on the cover – would ANYONE want to read that? Myself, I cannot think of anything I’d want to read less than seven overpriveleged Manhattanites whining about the cellulite on their thighs. Sometimes I get to the point where I just want to hide all the magazines for a month and see what that does to my mood and outlook. Wouldn’t it be wonderful to live in a world where our physical “imperfections” didn’t trouble us so much, and food was not the enemy? Sigh….. Happy Birthday to Victor Garber! Today is the birthday of my fave celebrity crush, Victor Garber – he’s 58 and he’s a silver fox! I love Victor, and this year I wish him a better TV series than that God-awful Fox show “Justice” – which mercifully didn’t last a whole season. Victor’s most recent appearance was in the Encores concert production of Stephen Sondheim’s “Follies” in New York – only the latest of Victor’s many performances in Sondheim’s work. (He was the original Anthony in “Sweeney Todd,” the original John Wilkes Booth in “Assassins,” and starred in a Los Angeles production of “A Little Night Music.”) I love Stephen Sondheim, too – but that’s a whole different kind of love that what I feel for Victor. Happy Birthday, Mr. Garber – you are still gorgeous. I don’t feel this way about February every year, but I sure feel this way about February 2007. The month just past was an awful month here in Chicagoland. Heavy snowfalls. Icy roads. Subzero wind chills. Way too much use of phrases like “Winter Storm Watch in effect” and “Strong winds causing blizzard-like conditions” on the morning newscasts. But the last four days here have been like a trip to Heaven. Beautiful, sunny skies and temperatures inching up every day, to a high of (gasp!) 70 degrees this afternoon! I had lost a card, but I’d lost in mid-February, nearly a month ago, during the worst of (what I like to call) the “assault weather.” I’d used it to buy gas, and then tucked it into the pocket of my Lands End down parka. When I went to retrieve it the next day, it was gone. I’d scoured my car, my purse, my desk and my entire home to no avail. I’d long ago cancelled the card and opened a new account. But today, under a sunny blue sky, someone found my card in the parking lot at work. It had apparently been buried for weeks in a pile of wet, dirty snow that had finally melted. The security guard handed the card to me – it was scratched, tattered, and mud-splattered. “I really had to work just to clean it off enough to read the name on it,” she told me. It’s an ugly little card and worthless now, but for some crazy reason, I want to hold onto it. Every time I think I’m being oh so original, clever and cute…. I inevitably get brought up short. In my previous post, I called myself a Frugal Fashionista – and really thought this charming little moniker was all my own invention. Turns out, there was a Frugal Fashionista in the blogosphere well before I arrived. Check out this site if you want to dress like a star on a normal person’s budget. I am what you might call a frugal fashionista. There are two kinds of fashion thrills in my life. One is when the new issues of Vogue, Elle and Harper’s Bazaar hit my mailbox. I pour over them for hours, admiring the beautiful shapes, lines and colors of the latest fashions. But I NEVER actually purchase any of the lovely things I see. ($3000-plus for one lousy purse? Louis Vuitton, Schmouie Vuitton! The bag may be beautiful – even breathtaking – but when it’s choice between a handbag and five or six mortgage payments, the mortgage company is gonna win every time.) These are my vicarious fashion thrills. My hands-on fashion thrills generally involve an outlet mall. Typically, a trip to an Ann Taylor Factory Store is the highlight. (Take a look through my closets sometime. Were you to peg me as the kind of gal who puts her name in all her clothes, you’d be convinced my name actually was Ann Taylor.) One of my proudest moments in the last couple years was scoring a gorgeous black burn-out velvet cocktail dress at the AT Factory Store for a mere $29 – marked down from $110. Paired with a floaty black evening shawl, it looked gorgeous when I wore it to Elton John’s show at Caesar’s in Vegas – even though I was surrounded by concertgoers decked out in denim shorts, white Reeboks and fanny packs. Oh well. My personal philosophy is when in doubt, over dress! Anyway, as fashionistas go – frugal or otherwise – I am also a proud member of the fashionista subset called Shoe Whores. I love shoes – but more than that, I love getting a great bargain on beautiful shoes. My biggest shoe disappointment of 2006: Saying goodbye to a pair of Impo faux-snakeskin mules I had purchased off the deep discount racks at the back of DSW for $19.50 in 1999. I loved those shoes – I wore them with jeans, sometimes with denim skirts for 7 years, always to appreciative compliments from fellow shoe lovers. They were fun, funky – and surprisingly comfortable. Last summer, I had to toss them out when the left shoe literally snapped in half at the instep. I wore the crap out of those shoes – I milked that $19.50 investment for all it was worth. And I really wish I still had them. Disclaimer: Yes, there were used shoes. In the parlance of Ebay, they were “gently worn.” But I couldn’t be happier with them. They arrived in excellent shape and looked fabulous. Which brings me to my latest Ebay shoe adventure. And ever since that episode was broadcast in Season four, my quixotic shoe-loving quest has been to obtain a pair of Manolo Blahnik black patent leather mary janes – for well under the original $595 retail price. When I first spotted a “gently worn” pair on Ebay last summer, I confidently entered a maximum bid of $175. I immediately became the top bidder – a status in which I remained for about half a day. Outbid, my confidence shaken, I quietly searched my soul. What was I really willing to pay for those fabled mary janes? What amount could I justify to myself? One the one hand, $175 for used shoes seemed ridiculous – on the other hand, these weren’t just shoes! More like a fine museum piece really, I reasoned with myself. Upping my bid to $215 seemed reasonable. So I entered my higher bid and sent myself off to bed, dreaming of how great those shoes would look paired with my new beige and black wrap dress from Ann Taylor. To no avail. By morning, when the auction closed, someone else had swooped in and pushed the winning bid up to $425! While I was disappointed that the shoes had not come to me, I was, at the same time, greatly relieved that I didn’t have to cough up $215 plus shipping costs for a pair of worn shoes, gently or not. I had never paid that much for a new pair. My practical self had quarreled inwardly with the my lover-of-beautiful-things self. I’m not sure which side of me won that round – I just felt worn out. I think I wanted to just avoid that inner turmoil again, so I put my shoe quest aside and went about my life, making the occasional trip to DSW, scoring a great pair of brown, kitten-heeled Franco Sartos here, some black suede boots there. Always fun, never too heart-stopping. Then, last Friday afternoon. during a late afternoon, end-of-the-workday, time-killing Internet browse, I got pulled into the designer shoe listings on Ebay. And there they were. Those magical MB mary janes, size 38, gently worn (“worn only twice – both times to local business meetings” the seller assured. Thank God they weren’t worn to Walmart!) The high bid was $177.50. I began to quiver a little. Should I risk it again? Should I put myself through the wringer. I decided to be cautious. I added the shoes to my Ebay watch list, and went about my day. At ten pm, the shoes were still going for $177.50. By Saturday morning, the bid was up to $220 – already past the amount I had long ago decided was my maximum. I continued to ponder, but couldn’t bring myself to make a bid. Sometimes I just don’t have the will to find out whether my love of beautiful things trumps my love of financial stability. Manolos are beautiful, but money in the bank is safe. Eventually the shoes sold for $370. Again, I’m relieved that I’m not the one paying the $370 – but I sure do like those shoes? Will the day every come that I can own these shoes for $215 or less? Stay tuned…..
Last year, I started a blog called “Joni’s Window.” I was determined to write all kinds of profound and meaningful things, while at the same time keeping my friends up-to-date on my latest comings and goings. Somewhere around July, my plans went straight off the rails, and the “Window” has been mostly closed ever since – save for post or two about Robert Altman’s death and Bette Midler’s Christmas CD. 1) I found it was exhausting to even TRY to write profound, meaningful things on anything like a regular schedule. Too much pressure! I set the bar way too high and scared myself away from writing. 2) I fell in love. And my life took on a whole new rythymn. I’d been the prototypical single, independent woman, making the most of my single life – and then, I wasn’t going through life by myself anymore. My schedule changed, my life changed – my writing time went out the “window” (no pun intended) while I figured out how to live my life as half of a couple. Nine months later, I’m starting to get the hang of it. Even now, as I’m writing this, my sweetheart is in the kitchen, making us a lovely Saturday night dinner. Yes, I had the amazing luck of finding a man who cooks! So, it’s time to start writing again, and starting a new blog seemed like a great way to start fresh. Where does the name of my new blog come from? 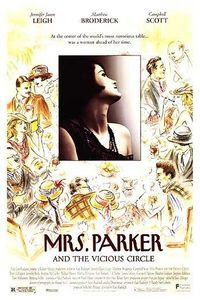 One of my favorite movies is a bio of the legendary writer Dorothy Parker,”Mrs. Parker and the Vicious Circle.” In it, Ms. Parker tells a psychiatrist who attempts to help her: “I drink, but that’s because I’m thirsty. I fall in love, but only with married men. And I write doodads because it’s a doodad kind of town.” I love that line. I can find no evidence that the real Dorothy Parker ever uttered those words – they’re likely the work of a talented, modern-day screenwriter – but, to me, they’re pitch-perfectly Parkeresque. Writing profound, meaningful things is a daunting task. When I approach my writing with that as the goal, I inevitably wind up feeling defeated and useless (especially when I end up dishing about Celine Dion or Woody Allen instead – see the old blog for evidence!) But I CAN write doodads – that’s not daunting, that sounds like fun! So doodads it is from now on – hopefully entertaining doodads, but just doodads all the same. Thanks for reading, and please keep coming back.